Blue is Better in the Bahamas . . . Mother Nature dipped into her color palette and painted a symphony in blue major. You can’t help but relax when you’re surrounded by that much blue. And the Bahamian people are every bit as colorful — always smiling and waving. I like smiling nations. Everyone is on island time. Relax, check your worries at the door. 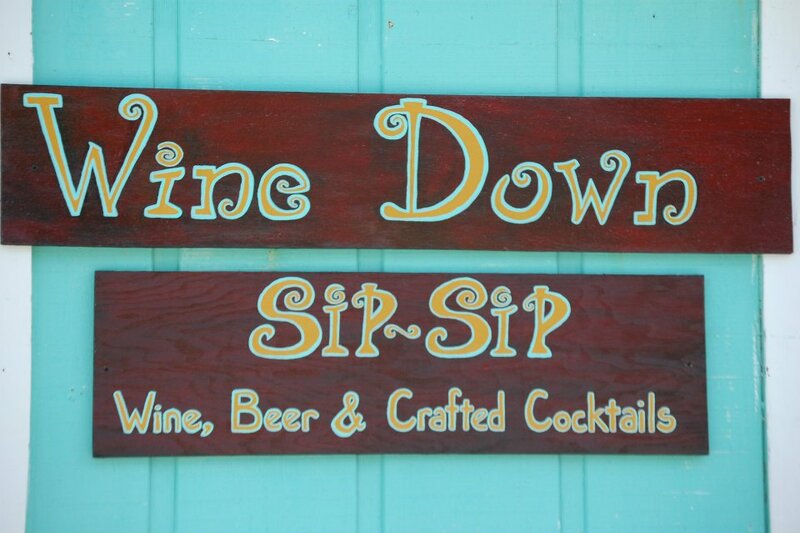 There’s only one problem in the Bahamas: there’s no wine. No wine? Where were we? Gilligan’s Island? Close. We were on Elbow Cay in the Abaco Islands. Elbow Cay is an out OUT island that’s 6 miles long and 1/4 mile wide. Elbow Cay was established in 1785 by British Loyalists who decided they’d better high-tail it out of the newly forming United States of America before things got too real. You arrive on the island by boat and boat alone. There isn’t an airstrip and there are no cars (except service vehicles) on the island. Everyone zooms around on golf carts. You want to visit another island? You need a boat. Chickens and curly tail lizards outnumber people. An amenity, if you ask me. The Internet works, most of the time. But for whatever reason, the telephones on the island work about as well as The Professor’s coconut radio. Which explains why everyone has a VHF radio. What kind of civilized nation doesn’t have wine? To be fair, they do have wine. It’s just that a lot of it falls into the bulk category, and it’s super expensive. Think restaurant wine list prices at a retail store. But the real issue is storage. Restaurants and liquor stores are technically air-conditioned, but air-conditioning in the Bahamas means 83 degrees. 50 degrees isn’t even possible in the Bahamas. The ocean is 100 yards to the right. And it was 87 degrees in this room. 87 degree red wine is not good. Wine is expensive . . . groceries are even worse. Everything on the island has to be imported, either from the Nassau or the United States, so prices border on extortion. Behold, a gallon of milk . . .
A six-pack of Diet Coke is $8. You get the idea. And so we buy $10 milk and $8 Diet Coke. But we don’t buy the wine. Yes, you read that right. 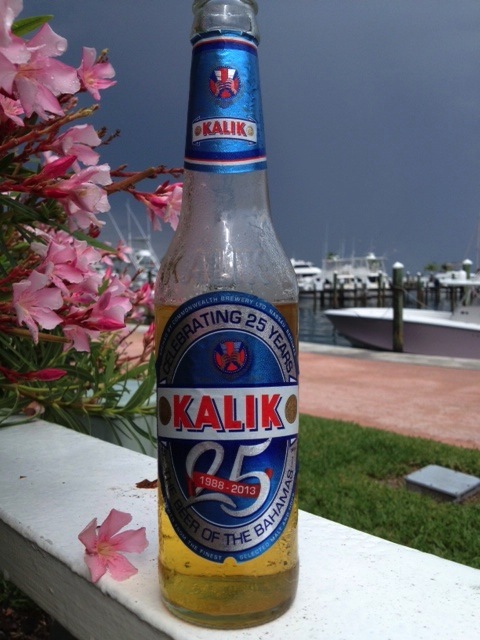 We drink Kalik (the beer of the Bahamas), and rum. LOTS of rum. The name Kalik is pronounced ka-LICK. It derives from the sound cowbells make when they click together. The cowbells are famous at the Bahamian festival of Junkanoo (a street parade held on December 26th). The origin of Junkanoo dates back to the 18th century and a legacy of slavery. Slaves were given 3 days off at Christmas, and they celebrated with colorful costumes, dancing and music. They’re all a variation of the same theme: a blend of rum(s) and a handful of other liquors (the recipes are secret, of course), mixed with some sort of fruit punch concoction. The drinks are tasty and potent. And about $9 each. The first one goes down so quickly, you crave another. And before you know it, your bar tab is the national debt of Liechtenstein. 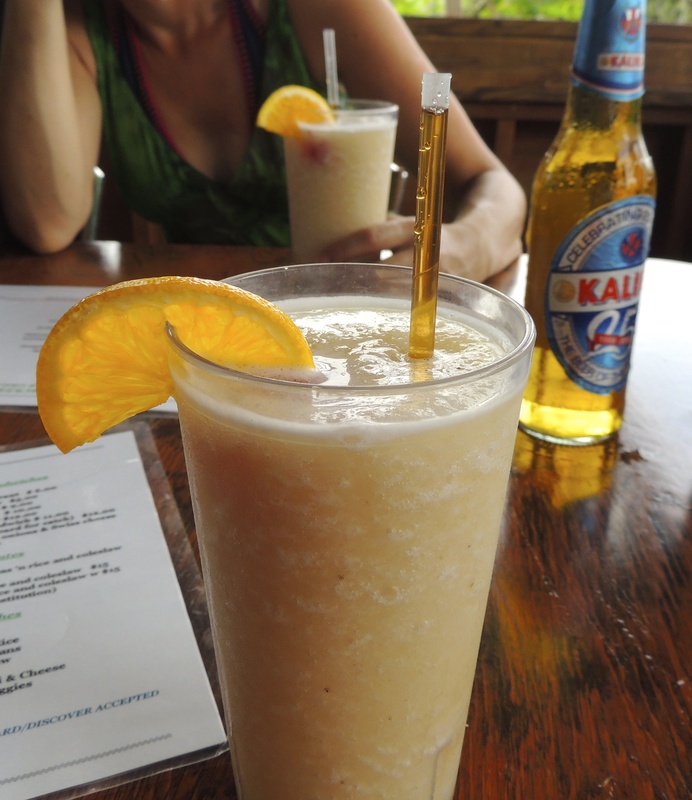 By FAR and away, the best drink I had in the Bahamas was this fresh Banana Daiquiri. Amazing. I could have had four. I would have been sorry, but I could have done it. That first sip is ALL rum, and it’s a dooozie! I am so making these at home. A word (or 93) about Bahamian food. Bahamians love to fry the heck out of everything. I’m not sure why. Conch (the snail-like creature that lives in the “you can hear the ocean in here” shell) is the national food. You can get it fried, coconut fried or fritter fried. You can also get it in a refreshing non-fried salad, ceviche style. The favorite Bahamian side dishes are Peas & Rice (essentially black beans and rice), and baked macaroni and cheese, which is served in pieces, like a casserole. It’s slightly spicy and delicious. Before you start thinking I went cold turkey on wine for an entire week, I did manage to smuggle 3 bottles of wine into the country. And we bought a bottle of wine at a wine bar one night. So that’s 4 bottles for 4 adults over 8 nights. If I do the math (something I rarely do), that works out to about 3 ounces of wine per person, per night. It was practically war rationing. 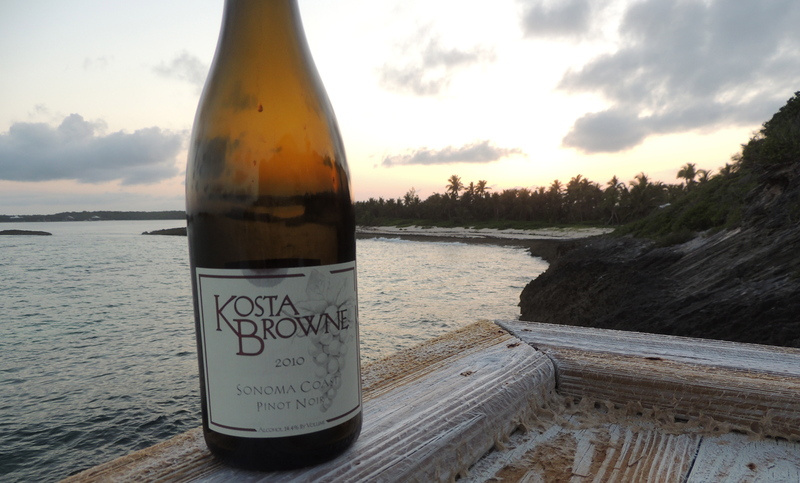 One of the bottles I brought was this Kosta Browne Pinot Noir. We drank it at sunset one evening. It was perfection. But it would be tough to drink a “bad” wine with this backdrop. 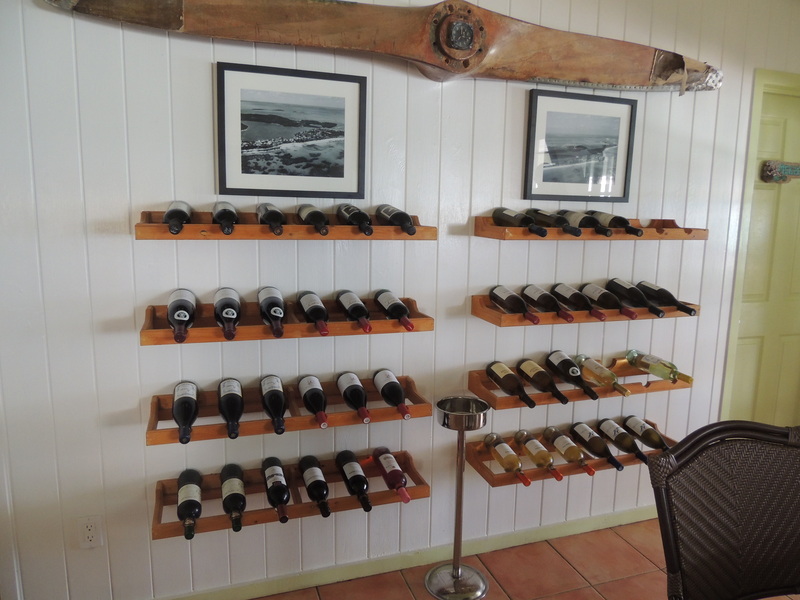 Elbow Cay has a wine bar, so naturlich, I had to try it out. It’s called Wine Down Sip Sip. 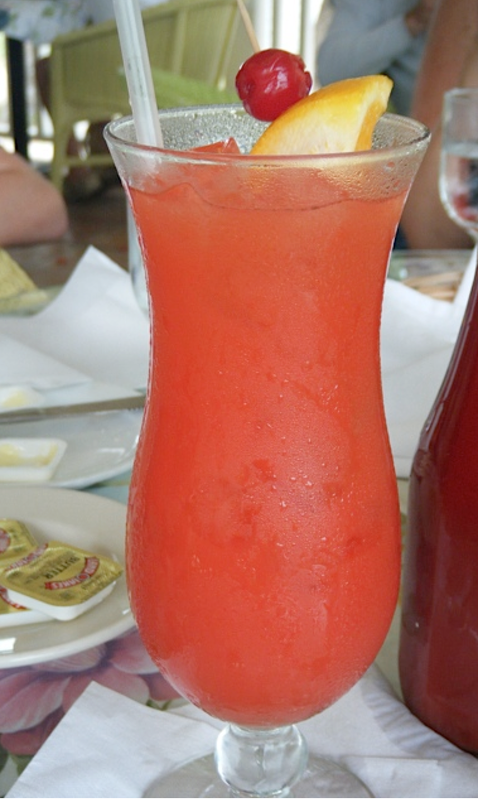 Sip Sip is Bahamian for gossip. It’s really more of a bar with wine than a wine bar, but we had a lovely meal there. And by lovely I mean it wasn’t fried. The proprietor pretty much ignored us (booooo), but our waiter, Erik, (who is also the paddleboard/surfing instructor on the island) made up for her indifference with charisma in spades. 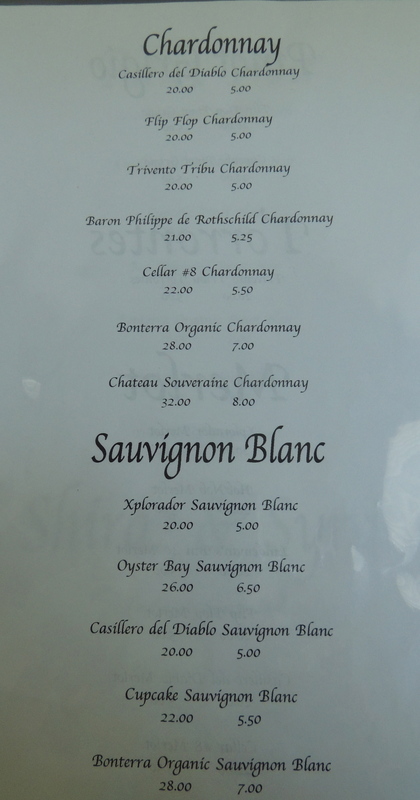 Here’s the White Wines list from Wine Down Sip Sip. It’s fairly representative of what’s available on the island. So what did we do when we weren’t rumming it up? 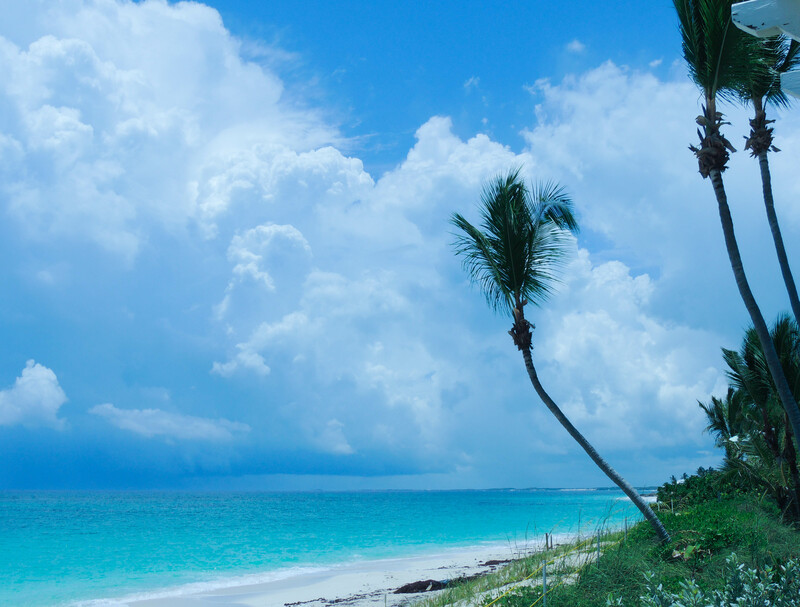 The Abacos are a wonderful place to visit. Go for the blue . . . the people . . . the rum. Go home for the wine. Thanks, Julian! This vacation is actually in my rearview mirror . . . but it was fabulous!! Salud! No Senior Frogs??? Love the Bahamas!!! Looks like you had fun. Save some that sea glass to freeze and drop in your wine for a quick chill fix. Not a Señor Frogs for 200 miles! A great trip . 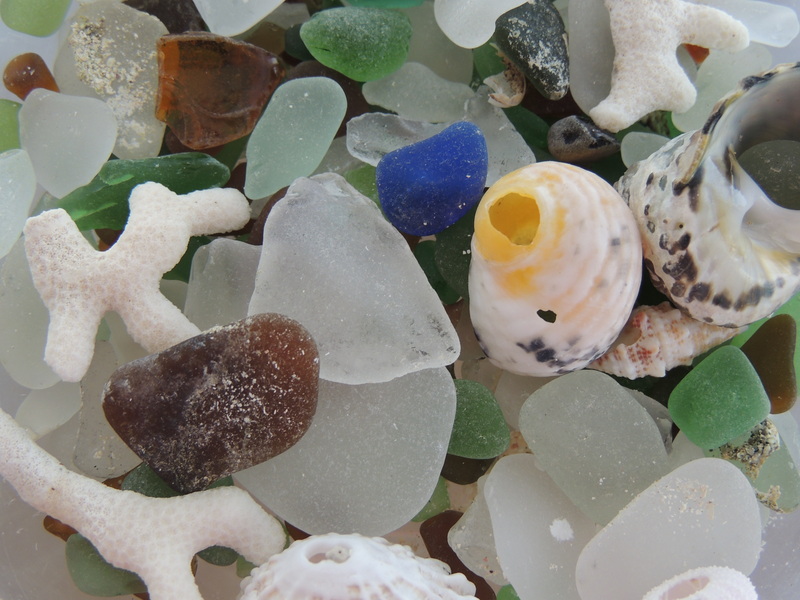 . . love the sea glass tip! It would make a gorgeous glass, too! Salud, rwd!! Pretty awesome, Kirsten!!! Despite the wine shortage, that is! On the other hand, I love Rum and that would certainly be a good substitute to wine, but after tasting Rum Agricole I can only go back to industrial rum for cocktails. Man, that stuff is DIVINE! Did you get to taste any brand that you particularly liked? There is a Bahamian rum called John Waitlings, but the liquor store owner on the island wrinkled up her nose when I asked about it. She pointed me toward Mount Gay (from Barbados) instead. I definitely prefer the gold rums. Will have to try to get my hands on a bottle of Agricole. Sounds amazing! Salute . . . ! Have a wonderful vacation, even without wine it seems you are well taken care on the drink front, $10 for milk, holy cow!! Thanks, Suzanne! 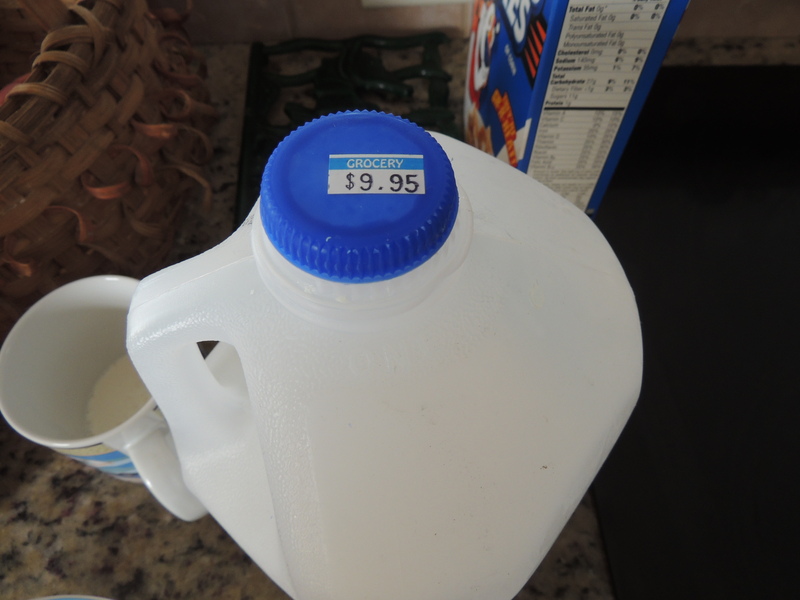 The milk prices still have me in shock . . . too bad the kids can’t drink rum! ;o) Salud! LOL!!! Next time I would bring some of that parmalat with since unopened you don’t have to refrigerate. Still can’t get over those prices. Have fun! Looks beautiful! Those prices on the wine list – are those not American dollars? They don’t seem like such crazy prices if they are American dollars, so I was curious! That banana daiquiri looks amazing! Bahamian dollars are 1:1 interchangeable with USD, so yes, they are in USD. I thought the prices at the wine bar were the most reasonable (least crazy :o)) on the island. But you’d pay those prices at a retail store, too. I’ll take fresh banana daiquiris all day long over $20 Cupcake SB! Cheers!! Great post! Love all the pictures, beautiful. I have to say that I can live with the wine prices in the list you shared (and with the wines too), but $10 milk? OUCH! Love, love, love your opening line. Hilarious about the wine detox though. So glad to have found your blog. Thanks so much, Sally! I’m so glad you stopped by . . . Salud! Thanks for stopping by, littlehouse! 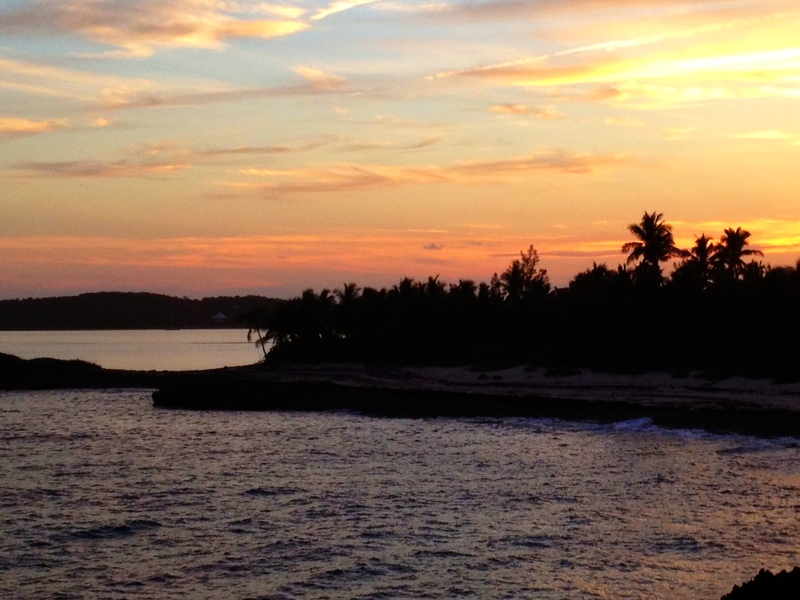 Visiting Abaco is like visiting a postcard, isn’t it? Salud! !